Budget Electric knows your home is your castle. We also understand that it needs to be a safe place to live for you and your family. Located in Dubuque, Budget Electric has been serving the eastern Iowa area for over 30 years, including Galena in northwest Illinois. We work hard to make sure that your home is protected by providing proper maintenance, repair work, inspections and the replacement of old wiring, panels and system components. Your home and property are a big investment, but you can’t put a price on the protection of your family, which is why we offer our services in installing smoke and carbon monoxide protection. Whether you own a condo apartment, townhouse, single family home, duplex or residential apartment building, we can help with all your home electrical repair needs. We repair door bells and intercom systems that are not functioning properly. We repair and install ceiling fans, chandeliers, dimmer switches and other lighting fixtures. We make repairs to bathroom and kitchen fixtures and appliances and repair or replace nonworking switches, sockets and outlets. We also fix what your uncle, brother ,dad, friend, neighbor supposedly had fixed earlier! 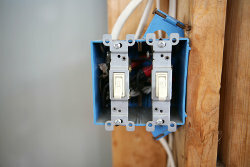 If your are undertaking new construction, rehabs, remodels, new additions, or if you have recently purchased an older home that requires a lot of work, we can help devise a plan to replace outdated electrical wiring, outlets and light switches to lower the risk of fires caused by electrical shortages. If your are buying a new home that just needs a few repairs, we can perform an inspection and offer solutions that will be affordable and performed quickly so you can enjoy your new home. There are risks when using an electrician that is not fully licensed and insured, or who may not be insured in your area. Improper installation and grounding can be a fire hazard. Poorly maintained electrical systems can also cause major damage and pose a risk to the safety of your family. Choosing Budget Electric for your home repair needs will get you a dedicated team of hardworking electricians committed to serving residents of Dubuque, IA, Galena, IL and the surrounding communities. We offer our services in troubleshooting and repair work for breaker panels and can offer whole-house surge protection, electric baseboard heating, lighting upgrades to LED. We install and repair recessed and track lighting inside the home as well as outside landscape, porch, patio, pool and driveway lighting. We make repairs to ensure proper fire protection an install and upgrade smoke and carbon monoxide detectors. Electrical repairs should never be put off for another day. The risk of fire or electrocution is something that should be dealt with head on by experienced master electrician. For all your commercial and industrial electrical needs, choose the electricians at Budget Electric. 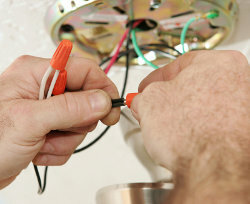 As master electricians, we have have serviced the area around Dubuque, IA for over three decades. Call 563-590-5679 for all your needs in installation and electrical repairs. No job is too big or too small. We accept credit cards, personal checks and cash. Call today. © 2019 Budget Electric. All rights reserved.